It’s a question that has entered my mind on more than one occasion this season. It’s a good question, one that a person like me really should be asking themselves. 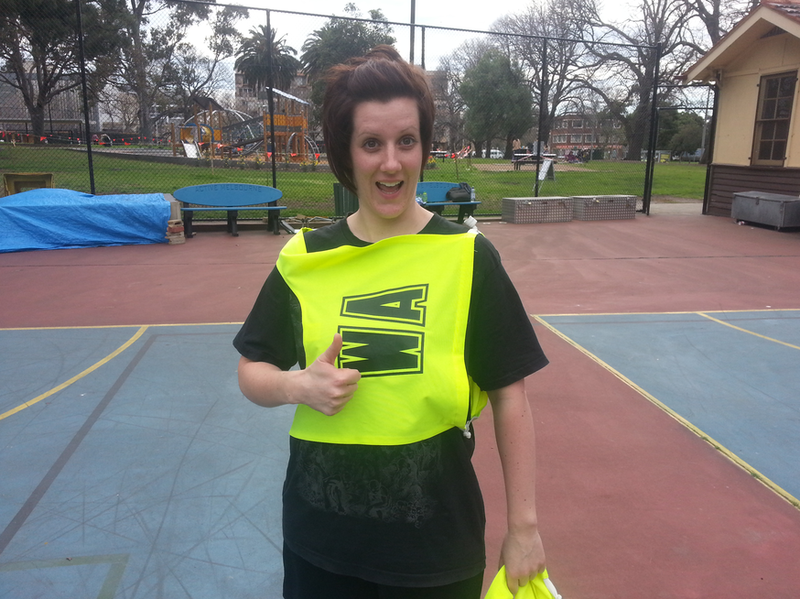 Each time I asked another Envato employee enthusiastically, “You coming to netball today?”, the look I received reminded me that I should be able to explain why I love the ‘Varks. As a small boy following and loving sport, I idolised certain sportspeople, each of them to me embodying some trait that I admired. Andrew Gaze, Jim Jess, Liz Ellis, Robert De Castella, Steve Moneghetti, Muhammad Ali, Glynis Nunne, Alison Invererity. Champions every one, except Alison, however on reflection, her prowess as a high jumper was here nor there to me. As I made adulthood a few things happened. I realised that I’d never walk amongst my sporting heroes as an equal, held back by a blinding self absorbtion and a vacuum of talent. I got married, settled on a career and had some kids. So did Alison Invererity. Sports idols began to mean less to me as life awakened me to their unattainability. These people were special. They were not like me. They were in an exclusive club that I could not join. I couldn’t speak to or relate to any of them. I’d always wanted to believe that elite sports people were real and accessible, but that just isn’t the case. Not only that, but heroes had become scarcer. Each time a dwarf gets set on fire, or some rugby league star takes a dump in a hotel hallway you realise that perhaps simply being good at sport is not enough to make person deserving of admiration. I resented them for shunning me and for letting me down so often. Then, a few years ago it dawned on me. I was looking at it all wrong. My sporting heroes were first and foremost great at sport. But secondly, I was insisting that they also be likeable people, plus I wanted to talk to them, get to know them. I wanted them to be my friends. That wasn’t their problem, it was mine. I had it in the wrong order. What if I found some sportspeople that I already knew and liked, guys that I already caught up with for a drink, who already had my number in their phone, and recast them as my heroes! Wouldn’t that work? The benefits of this reclassification occurred to me at once. I could watch my favourite teams for free, or really cheaply. I could call up my heroes after the match and talk about how things had gone, how the side was looking for next week, were there any injuries? If I redefined for myself the notion of sporting brilliance, I’d have the opportunity to rub shoulders with the “greats” every week, and all I had to do was signigicantly lower my expectations in just two areas – athleticism and skill. Local sportspeople are no less determined than the pros. They’re less adept and not as well prepared, but I reckon they have fleeting moments that match the best you’ll see, it’s just less frequent. How many times have you heard an AFL fan claim they’d seen a “crap game”? They expect a certain level of play and are disappointed when it’s not on display. Watching local sport is the opposite. One meanders through great portions of less than inspiring play (which is the expectation) waiting for the occasional exhilarating flash of brilliance that has you telling people what a “great game” it really was. When it all comes together, you recognise it instantly. It’s those moments that I go along for. When the Aardvarks move the ball from one end of the court to the other through a succession of perfect passes. When Justine gets on a 3 goal run. When Josh eclipses his tiny female opponent. When I get to see Kelly chase some hapless wing defender like a hungry animal. That’s where the gold is. Truly. In actual fact, I initially went along to the games to get to know people. The team was put together not long after I started at Envato. I needed to get amongst my work mates, especially those outside of my team and teams I saw every day. It worked too. Jo turned out to be more than just the person that processed my employment contract. Justine turned out to be a better swearer than me. I also wanted my new colleagues to know that the new guy plastering the walls with coloured cards was not simply the worst interior decorator they’d ever seen or some weird Clarke Kent / Slim Dusty hybrid. I wanted people to “get” me. I wanted to make friends to have a few laughs. I was raised (accidentally I think) to understand that the level of involvement in one’s community is always matched (at LEAST) by the personal reward of that involvement. So I made a flogger. Thank you to all the 2013 Envato Aardvarks and Greenlow winner Jo Miller. The season was a success by every measure except games won, which says a lot about a side for whom that particular measure is the least important. I look forward seeing you all run around again next season. Our first premiership year.